Press 195: Are they REALLY “Sandwich Kings”? This gorgeously decorated restaurant is a local favorite to Rockville Centre, NY. They serve good selection of beers and has a full bar…as well as a wide variety of pressed sandwiches (hot or cold), fries, soups, burgers, knishes, and salads! They even do free local delivery from Monday – Sunday 11:30am to 9:30pm. If you’re in the area…you know to call 516-536-1950. You cannot miss this place with the nicely designed sign “PRESS 195” and the floor to ceiling glass, where you can peer into the full-bar area. They also offer Lunch Specials from Monday -Friday 11am – 3pm for half a sandwich/salad AND Belgian fries/house salad/soup of the day FOR ONLY $10!!! These sandwiches are delicious and savory. 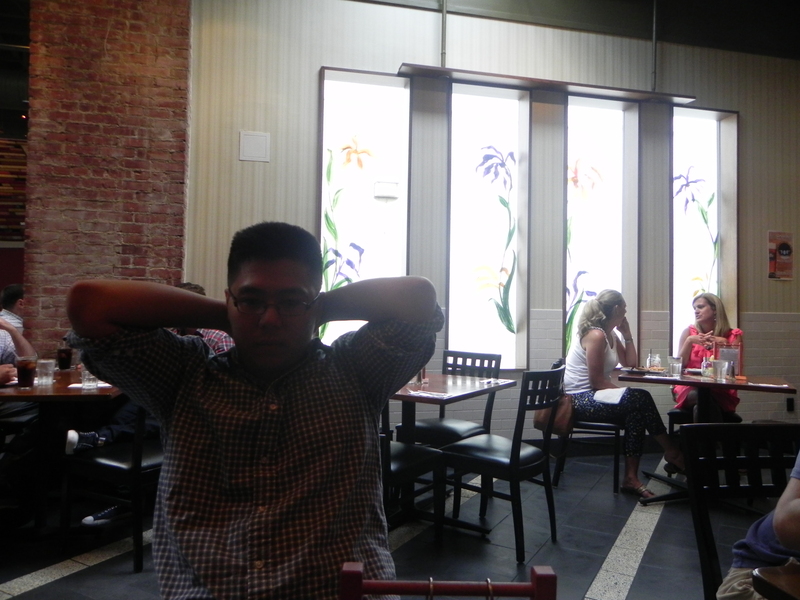 Press 195 is an interesting, yet beautiful restaurant. It has warm colors and has a lot of windows for allow natural light. It’s aesthetically pleasing and this place is just nice to be in. The waitress we had was very nice, but she didn’t ask if we ever wanted refills or any napkins. Now onto the food and drinks! I ordered a root beer float. Pinky wanted an alcoholic drink, but sadly… it was happy hours… but not where we sat. The root beer float was okay. I’m pretty sure I could have made it myself. It was just 2 scoops of ice cream with Saranac Root Beer. Still… I really enjoy drinks from Saranac. 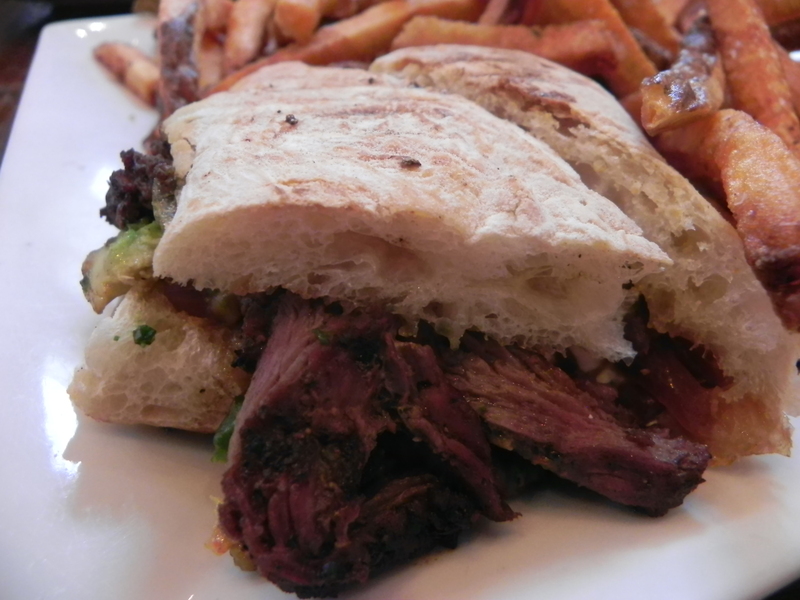 Repeating what I said earlier, the sandwiches are delicious and savory. I ordered a Hot Press sandwich #43. 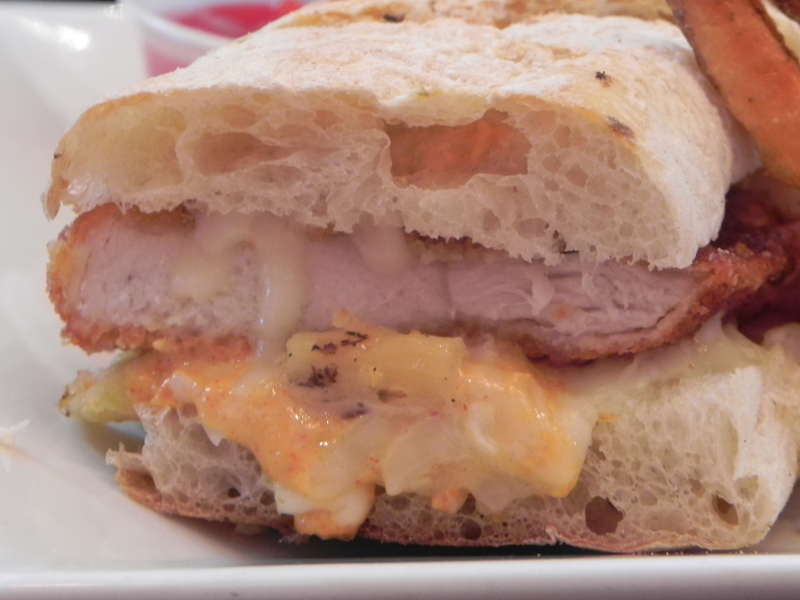 It contains Crispy Panko breaded chicken cutlet, grilled pineapple, Canadian bacon, Monterey Jack cheese, and Press 195’s famous chipotle sauce sandwiched in between 2 slices of crispy Ciabatta bread. Yeah, yeah, yeah… it sounds like something you may have had before, BUT ITS NOT. Its pretty freaking good…. and savory. 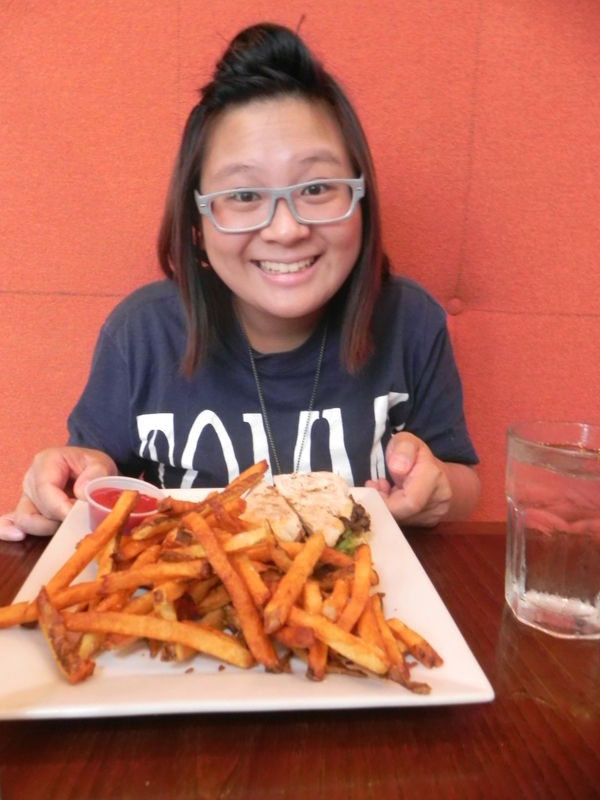 I ordered the 1/2 Hot press sandwich with belgian fries lunch combo fo $10. If I could change something that day about the dining options, I would have just bought a whole sandwich without fries. 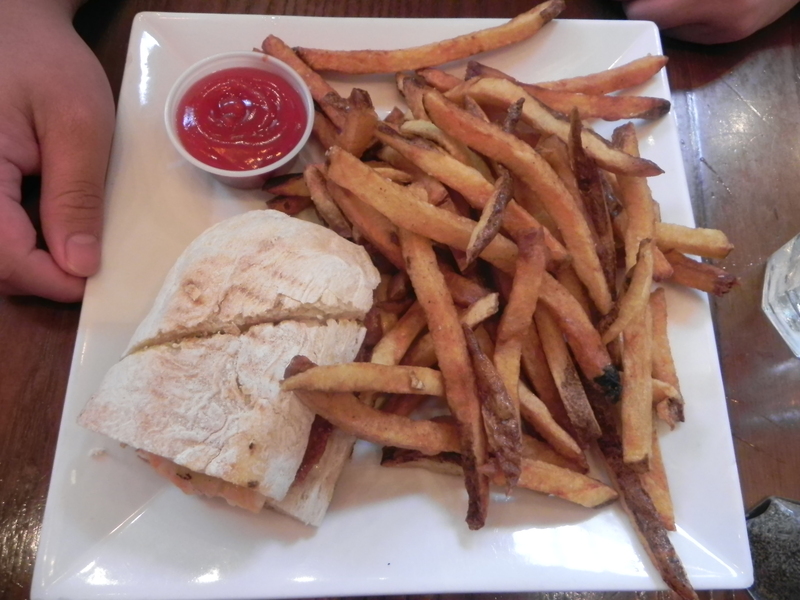 It’s not that the fries were bad… it’s just that sandwich was so good. Remember… it’s quality over quantity! Getting back to the sandwich… Sandwich #43 just melted in my mouth. The flavors complimented each other well. It was sweet and also a bit spicy. The chicken wasn’t too dry and you can taste the seasoning on it. I loved every bite of this sandwich. I think what makes this place so good is their delicious ciabatta bread. It is so crunchy and that it doesn’t seem like ciabatta bread. Its like an English toast muffin with that crisp. It’s unique and I would love to eat these sandwiches again in the near future. Definitely go check it out! Not very expensive and it’s quite good too! This place is so amazing. I just wish it was a lot closer for me…Even though they have a second location in Bayside (I hate riding the bus) I can’t even head out there. I was first impressed by their front door and all the mirrors and shiny decorated walls. It has a lot of natural light and can be seen as very trendy and modern. I was really excited to go to this place because of all the good ratings on Yelp. Yes, they are indeed true! I want to come back here often, as they have soo many sandwiches to try. I actually had one in mind, then the waitress came and asked me what I wanted. I answered, but in actuality I later realized I forgot my first choice and ordered a random one, #38. The steak was so tender!! I’ve never had onion jam — It was delightful, however I still would like more physical pieces of onion, not just them mushed together. It still worked really well with the avocado though. THE BREAD was the most fantastic thing on earth. Cripsy, crunchy, and most important delicious. I initially wanted the #29, Grilled marinated sliced steak, tomato, Provolone cheese, onions and homemade Chimichurri sauce. That is definitely on my first choice, once I step into this place again. AND CAN YOU EVEN BELIEVE?! $10 lunch special with BELGIAN FRIES?! AND THAT MANY?! I almost fainted. You loyal readers know I’m a sucker for fries. They were hot to touch and fresh to taste. There were some burnt ones on my plate though..I was a bit bummed out that they charge more for their Chipotle dipping sauce. Good thing I got a taste from Victor’s sandwich. Mwahah. Again, to die for. Note: My half star off was because I was bummed that they don’t offer the same happy hour price for their alcoholic drinks if you sit in the dining area. You have to be sitting at the bar if you want those prices. BIG BUMMER. Other than that, this place…..heavenly. 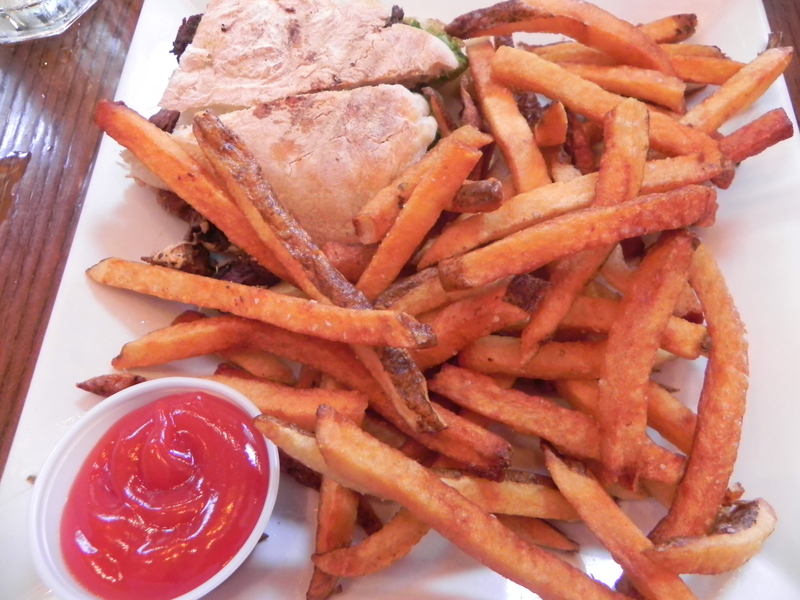 Posted on September 8, 2013 September 25, 2013 by pinkytwinkieeePosted in long island, New YorkTagged bar, beef, Belgian fries, burgers, catering, cheese, chicken, chipotle, crispy, delicious, delivery, drinks, fancy, food, fries, lunch special, meals, modern, panini, party, restaurant, rockville center, root beer float, salad, sandwiches, soup, special sauces, trendy, vegetarian. Previous Previous post: August Favorites! Next Next post: Caffeine Fix: Giving Up Taste for Presentation?